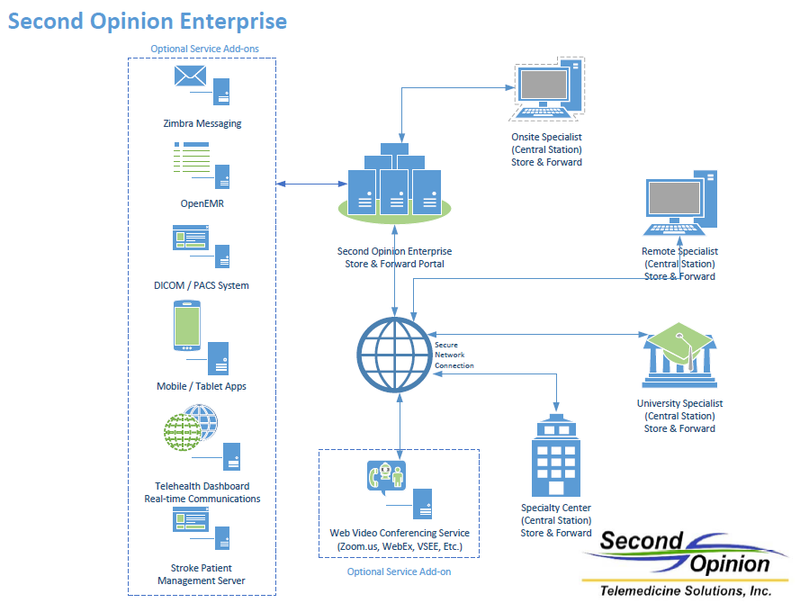 Second OpinionTM Enterprise is a natural product evolution from our client based Second OpinionTM Professional. It is our third generation Store and Forward product offering. It is server based and is accessed via a web browser and can be used in a variety of different medical specialties and research project scenarios. It was designed from the ground up to be a Referral / Consultation portal. It includes both formal and informal Referral / Consultation scenarios, can be located on-site or in a hosted environment and can be used standalone or in conjunction with an EHR system. The Enterprise solution is multi-site capable, has integrated Scheduling and web video conferencing. Enterprise is the backend database engine of our Mobile App Development platform and is fully integrated with our Telehealth Dashboard and Stethoscope Conferencing product offerings. It also has a MultiMedia Capture module to streamline the process of capturing both video stills and clips from medical scopes and other imaging devices such as scanners. Customer specific protocols can be created and plugged in making the Enterprise platform fully customizable. A Stroke and other protocol are currently available. Content created using Second OpinionTM Professional can also uploaded to the portal. Beside Telemedicine applications, we have many customers using our portal software for clinical trials, NIH studies, as well as forensic applications and peer review. The Second OpinionTM Enterprise solution can be installed on-site or hosted via a third party service such as Amazon AWS or Microsoft Azure. Multiple Administrator and User levels security profiles are built in. Users can have full access or restricted by medical specialties. Multiple sites can use the portal at the same time. Sites and sub sites can be created and Users and access to these sites can be managed centrally or at the sub site level. There is no limit to the number of sites. Templates can be created to help users fill in the clinically relevant data for a specific type of Referral. Consultation and General Note Templates can also be created. These Templates can be global or defined for specific sites and specialties. Specialists set their availability and users or coordinators can create their own appointments or video meetings. When a video meeting is scheduled the meeting information is included in the body. To prove that we can be fully integrated with an EMR platform, we chose OpenEMR, an open source EMR. Patients and Referrals created in either platform, Enterprise or OpenEMR, are accessible from both platforms. Users associated with a site only sees only their site. User accounts that have access to multiple sites have a single log on to all sites they are associated with. Project specific forms, protocols and reports can be added to the Enterprise portal. They can be simple one page forms or very elaborate clinical protocols. Our MultiMedia Manager Capture Engine connects to a variety of cameras and imaging devices to acquire both images and video clips. Vital signs for patient's can be entered manually for an encounter or can be captured via our Telehealth Dashboard Add-in product. The Telehealth Dashboard Add-in allows for the automated viewing and capture of vital signs and ECGs from the a variety of diferent medical devices. The Stroke Portal Add-in manages a stroke patient from the minute they hit the ER door to the point where the Nuerologist decides the treatment protocol. Connect with just about any type of device, phone, tablet, PC and standards based video conferencing CODEC from Tandberg, Cisco or Polycom.